Facebook has globally roll out it’s new Messenger Day feature for both Android and iOS platforms. This new feature – which is Snapchat Stories clone- was under testing until now and was available to number of users. Starting today this feature is rolling out globally, like the Snapchat and Instagram stories, Messenger Day will also take the format of sharing photos and videos with effects and annotations with friends for 24 hours. Moreover you can also integrate the rest of the chat experience too. First make sure you’ve updated your Messenger app so you have the latest version. Open Messenger, and tap on the camera highlighted with a sun to celebrate this launch. Doing so drops you right into the full-screen camera. Or, tap the “Add to your day” button at the top of your inbox to get started. Snap a quick selfie or take a photo or video of what’s around you. To add art and effects, tap the smiley face icon in the top right and then tap to add to your photo or video. You can also add text over your images by tapping the “Aa” icon, and you can overlay a drawing by tapping the squiggly line in the top right corner. Once you have your photo or video the way you want it, tap the arrow in the bottom right corner. You can then add directly to your day, save it to your phone’s camera roll, and/or you can choose to send it to a specific person or group of people. The photo or video that you add to your day will be viewable for 24 hours. 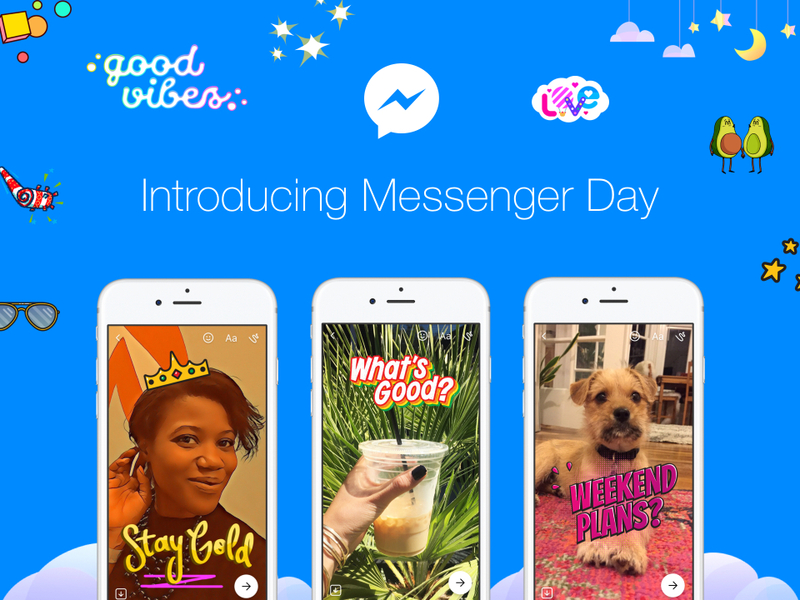 Messenger Day is rolling out now through the latest version on both Android and iOS platforms.